1) The first way would be to define movement in each and every class, every character will have its own move() implementation. In this way there is no code reusability and we can not change the implementation at run time. 2) Make a separate MovementController Class and put an if else for each type of movement of an object. This is a poor design, with strong coupling, moreover using if/else makes it ugly. So, we would like to have a design where we can have loose coupling, where we can decide the movement algorithm at run time and there is code reusability. Lets see this complete implementation using Strategy Pattern. We will have our base abstract class as Character Class, which all the characters can extend and set their own MovementBehaviour implementation. So, each Character : King,Queen,Bishop will extend Character and they can have their own implementation of Movement Behaviour. Here for simplicity, I have called the setMovemementBehaviour method inside the constructor of King. With this example we can understand the Strategy Pattern. What if every character has different move strategy? Would it be good then if everyone implement just move() method from upper class/interface? I mean: would we then use simple inheritance over the strategy pattern? What would be better? PS. I could not post on JCG, I had problems with captcha. 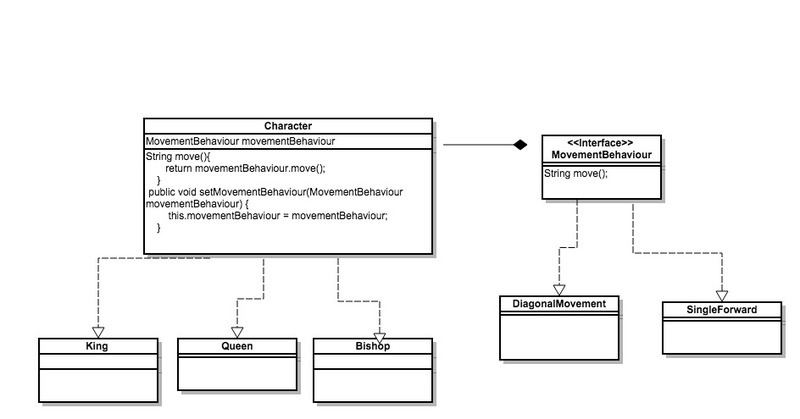 If every Character had their own implementation of move() then yes inheritance could be fine. But if there is a case, where a character does not move (hypothetical, like the wooden duck example which can not fly, stated in Head First DP); even then this character will have to implement move with something like ( “Action not supported Exception” ). The main benefit of Strategy pattern is in being able to switch out different implementations for different situations. Hope it helps. The strategy pattern is useful for situations where it is necessary to dynamically swap the algorithms used in an application.